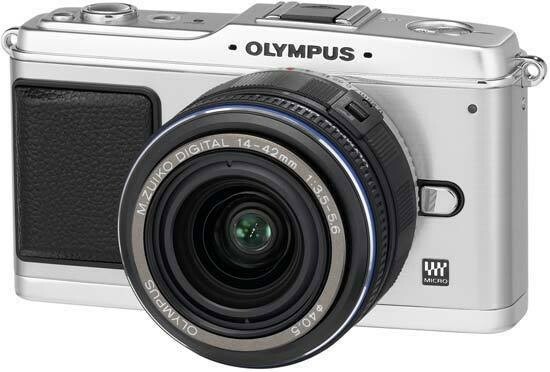 Listed below are some of the rivals of the Olympus E-P1. The Canon EOS 500D is the latest DSLR camera to jump on the HD video bandwagon, offering 1080p and 720p quality settings. Also known as the Digital Rebel T1i, the successor to the EOS 450D features a 15 megapixel CMOS sensor, 940,000 dot 3-inch LCD screen, Live View and ISO range of 100-12800. At $799.99 / £869.99 body only or $899.99 / £969.99 with the EF-S 18-55mm f3.5-5.6 IS kit lens, find out if the Canon EOS 500D is the best consumer digital SLR in our expert review. The Nikon D5000 is the latest digital SLR camera to incorporate a video recording mode, capable of producing 720p, 1280x720 pixel movies at 30fps complete with sound. The 12.3 megapixel D5000 also features a vari-angle LCD screen, making unusual picture compostions easier than with a fixed screen. More traditional SLR features include an ISO range of 100-6400, 4fps continuous shooting, and 11-point autofocus system. Retailing for £719.99 / €878.00 / $729.95 body only, or £799.99 / €972.00 / $849.95 with the 18-55mm VR kit lens, we find out if the Nikon D5000 can successfuly combine video and still images in our latest expert review. Looking for the smallest DSLR camera in the world? Step forward the diminutive Olympus E-450, weighing in at less than 400 grams. The tiny E450 is based on the FourThirds standard, offering a 10 megapixel sensor, 2.7 inch LCD screen and brand new Art Filters for creating your own digitally enhanced master-pieces. Is the Olympus E-450 worth £350 body only / £450 single lens kit in the UK, or $699 for the double-lens kit in the US? Zoltan Arva-Toth finds out in the World's first online Olympus E-450 review. The Olympus E-620 is an affordable mid-range digital SLR camera that offers a lot of bang for your buck. The 12 megapixel E620 features built-in image stabilisation, a free-angle LCD screen, compact dimensions and light weight, 7-point autofocus system and 6 Art filters. Is the E-620 the best Olympus DSLR yet? Read our expert review to find out. The new Panasonic Lumix DMC-GH1 is a new DSLR-like camera that can shoot both still photos and high-definition video. Based on the Micro Four Thirds standard, the Panasonic GH1 takes all the good points of the original G1 camera and adds a plethora of advanced movie-making functionality into the mix. Available now in black, red and gold for $1499.95 / £1299.99, Mark Goldstein finds out if the Panasonic Lumix DMC-GH1 is the best ever DSLR / video camera. The GR Digital III is the latest version of Ricoh's pocket camera for prosumer photographers. With a fixed 28mm wide-angle lens, high-sensitivity 10 megapixel sensor, 3 inch LCD screen and optional optical viewfinder, the Ricoh GR Digital III is certainly a serious camera. Mark Goldstein finds out if the GR Digital III can justify its equally serious price-tag of £529 / $699.